On an idea from Franklyn, I'm soliciting opinions on what are the ten most beautiful cars of all time. The way I'm going to work this is as follows: Write in and vote for what you think is the most beautiful car you've ever seen. If your #1 pick has already been chosen, give your #2 pick and so on. The first 10 individually different cars that show up on this list will go into a poll and we'll see what America thinks about which is most beautiful. 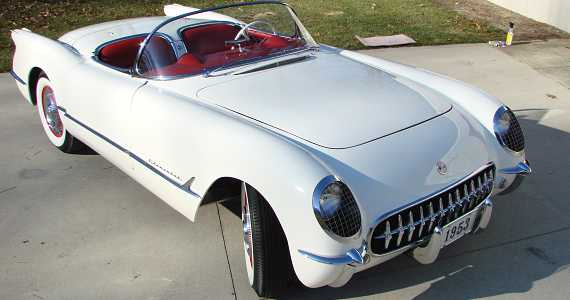 My favorite is 1957 Chevy Corvette roadster! Loved it when I first saw it on Gratiot ave in East Pointe(detroit) in 1976. I was sitting there in my parents station wagon and this red sparkling beauty raced by. I fell in love instantly. I'm still saving so I can one day cruise Gratiot! All of the above vehicles have that 'timeless' quality to their styling. Can you pick your favorite, Bear? What's your favorite from this list, Mopac? Hard to say, I sure miss cars the way they were built in those days.